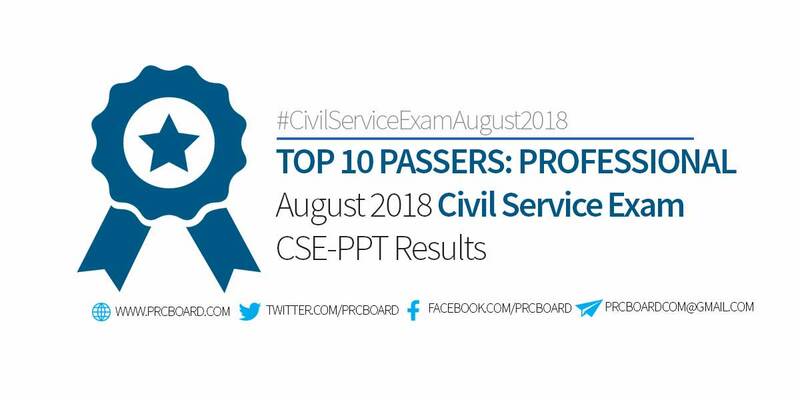 The top 10 passers in the Civil Service Exam Professional level for August 2018 are available at this website as Civil Service Commission (CSC) releases the full list 60 days after the administration of exams. The CSC recognizes the top 10 examinees who garnered the highest examination ratings both for professional and subprofessional levels. Shown below is the complete list of August 2018 CSE-PPT top 10 examinees - Prof including the Region they're from as well as their rating. The list is courtesy of CSC. Updated na po ba ung result ng region 9? Hi, good afternoon. When do we expect the release of top 10? Is it also 15 days after the list of passers has been posted? Thank you. Ang ratings po kailan namin malalaman? Sa caraga region po kilan po mapost ung top 10 list passers. ? Kelan po kaya ang release ng Top 10? nasa list po ba ng passers yung nasa top 10 or naka separate po sila? When will the list of Top 10 CSE PPT Passers be released? Thanks! Are the rating results available for cse ppt professional taken aug 2018?